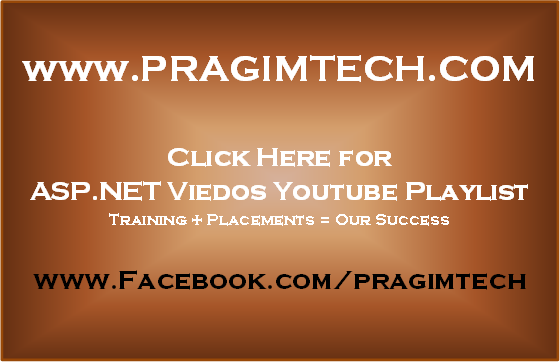 Please watch these videos, from the asp.net video tutorial by clicking here, before proceeding. In this video we will discuss about caching application data. It is possible to store application data in the web server memory, using the CACHE object, so that the data can be retrieved faster. For example, let us say, we have a stored procedure that takes 5 seconds to execute and return data. We can cache the data returned by this stored procedure with in an asp.net web application using the CACHE object, so that, next time when we try to access the data, we can get it from the cache, rather than reprocessing the stored procedure again. The following stored procedure takes 5 seconds to execute and return data. We are using WAITFOR DELAY, to introduce artificial query processing time of 5 seconds. Create an asp.net web application, copy and paste the following HTML in WebForm1.aspx. <asp:Button ID="btnGetProducts" runat="server" Text="Get Products Data"
Copy and paste the following code in WebForm1.aspx.cs. The code is well documented and is self explanatory. // If data is cached, retrieve data from Cache using the key "ProductsData"
// Cache the dataset using the key "ProductsData"
In this video, we discussed about storing application data in cache, using direct assignment. That is using a key and assiging value to it, as shown below. In our next video, we will discuss about all the other options that are available, to store data in the Cache object. what is diff between Caching application and session.